Rae Ann and Steve Gruver stood alongside Evelyn Piazza at the Ford Center on Tuesday night to tell stories of their sons who died in fraternity hazing incidents. Max Gruver and Timothy Piazza were pledges in fraternity chapters at LSU and Penn State, respectively, at the time of their deaths. The two families emphasized that hazing is not always alcohol related as it was with their sons, but can be associated with mental abuse and psychological battery, physical abuse, sleep-deprivation and financial extortion. Max Gruver was a pledge to the Phi Delta Theta fraternity at Louisiana State University in 2017. According to the Gruvers, Max passed away 29 days after beginning classes at LSU from being forced to consume 10 to 12 sips from a 190 proof bottle of diesel. According to Gruver, the older brothers of the Phi Delta Theta fraternity called the pledges to a “Bible study,” placed them in a disoriented setting and had them put their noses and toes up against the wall as they questioned them on their Greek knowledge. If one of the pledges messed up the Greek alphabet or answered a question incorrectly about their fraternity, they would be punished by taking a drink from an 190 proof bottle of diesel until they were told they could stop. “Can you really call this a brotherhood subjecting pledges to hazing like this?” Gruver said. Timothy Piazza was a pledge to the Beta Theta Pi fraternity at Penn State in 2017 and passed away on the first night of pledging due to a high blood-alcohol level and traumatic injuries after falling down a flight of stairs. “How did this happen? How did we get here? What happened at the frat house?” Piazza said. Piazza walked the audience through her experience of losing her son. She asked the audience to think about it being their loss and their pain to asked them what it would be like to have a permanent hole in their heart from losing someone they love after a hazing incident to prove themselves worthy of a Greek label. “Feel that pain in your heart and chest everyday. Wake up and think he’s not there. Go to bed and think he’s not there,” Piazza said. 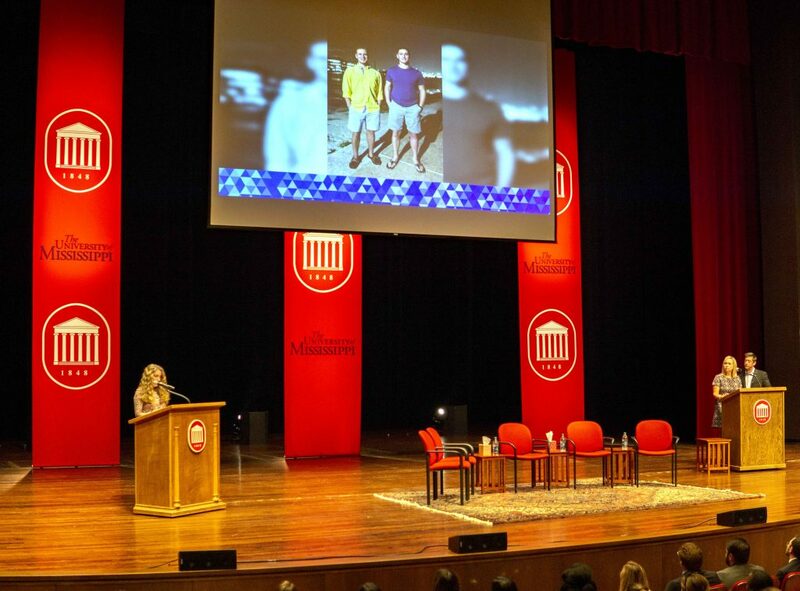 Before the event, The Daily Mississippian spoke to the parents about what changes Ole Miss’ Greek organizations can make to prevent hazing. Rae Ann Gruver emphasized the importance of students being active in hazing situations and calling 911 if needed. Steve Gruver explained that this attitude could change the way organizations deal with hazing. The three parents suggested steps that new members of Greek life can take to protect themselves and others, including researching the reputation of the fraternities or sororities and banding together with other students to stand up against hazing. The university began releasing Greek life scorecards last year with information about grades, philanthropy and violations of each fraternity or sorority. “If you see it start to happen, walk away,” Piazza suggested. The parents said they are focusing on changing laws — not just students’ attitudes. They have created model legislation to strengthen penalties for hazing in many states; Louisiana implemented a version of the law earlier this year.